One super-connected CEO does his summer paradise in style, with high-speed cellular service and home-automation services provided by Sarasota, Florida's SmartHome Integration. Remote islands can be such a drag if you're a jet-setting CEO who demands constant contact with the mainland. But this exec can have his vacation paradise and reliable high-speed connectivity at the same time, thanks to one top integrator who grabbed top honors for the installation in the 2018 CTA TechHome Mark of Excellence Awards. Cable Internet couldn't reach the retreat. Satellite wouldn't suffice. The integrator did his homework and found a cellular-based solution for consistent Internet service that supports advanced surveillance services, streaming media, and a whole lot of spreadsheets. 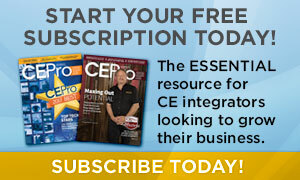 Here we highlight three award-winning outdoor installations, and the integrators who made them possible. 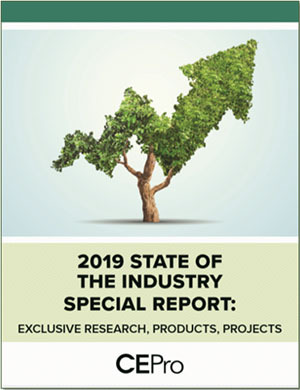 They come from the annual Home of the Year Awards by sister publication Electronic House, CTA TechHome Division Mark of Excellence Awards, and Lutron Excellence Awards. Illuminated in all the right places and at just the right intensity levels, a home’s outdoor spaces can look and function beautifully as entertainment venues where friends and family congregate to enjoy music and video mixed with fresh air and fabulous views. The inclusion of several comfortable, eye-pleasing outdoor living areas was top on the priority list during the construction of this 8,000-square-foot home nestled on a hill overlooking the Gallatin Valley near Bozeman, Mont. 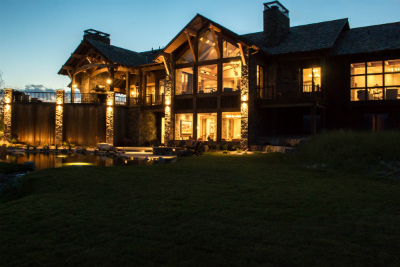 Recognizing the importance of smart, easily controllable lighting to the overall design of the rustic yet modern residence, the homeowners hired local integrator Smart Home Systems to design and install a Lutron HomeWorks QS system. 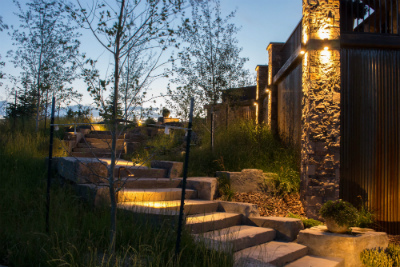 Smart, controllable lighting was absolutely essential, as the homeowners wanted the posh patios and porches illuminated, but without making the backyard look like a “landing strip,” says Smart Home Systems owner Randy Schram. There’s a fine line between an outdoor landscape that exudes elegance and sophistication while being highly functional, and one that’s uninspiring, uninviting and tends to go sorely underutilized. Making sure that the lighting was just right would boil down to Smart Home Systems selecting the appropriate type of light fixtures for each outdoor area, positioning each fixture properly, and programming the fixtures to brighten and dim to the most eye-pleasing levels based on the time of day, the occasion, and the activities taking place throughout the home’s expansive landscape. The fact that the majority of the outdoor lights are LED made the Lutron HomeWorks QS a no-brainer as the control system. “In today’s world of lighting, it’s always a bit of a challenge working with architects and designers to pick out fixtures that will allow them to be controlled, and controlled accurately,” Schram says. After the architect specified the arrangement of the light fixtures, Smart Home Systems programed the Lutron system to automate the settings of every light on the property. This setup would allow the homeowners to tap one button on any Lutron seeTouch keypad mounted to a wall or a mobile app on their smartphones to bring the outdoor areas to life. These areas include the main patio comprising a commercial-quality kitchen and home theater, a terrace featuring a pond and fire-pit, a smaller patio with a hot tub, and several stone-stepped pathways. Each lighting scene customized by Smart Home Systems activates specific groups of lights in one or several of these zones. By using the HomeWorks QS system, the lights are controlled automatically via an internal astronomical timeclock. Some of the scenes control other components, too, giving the homeowners the ability to completely alter the environment on a whim. An ENTERTAIN scene, for example, focuses on the main patio by activating fixtures in and around the outdoor theater, kicking on an outdoor heater, but only during specified months of the year, and turning on the TV and surround-sound system. While another scene brightens every exterior location so that guests are free to enjoy every inch of the property. Particularly appealing to clients is the WELCOME HOME scene that activates automatically when a motorized gate opens. The opening of the gate triggers the system to activate the landscape lighting that flanks the quarter-mile-long driveway. Of course, not all outdoor activities happen in the evening, and the HomeWorks QS system keeps the lights off during the day via its internal astronomical timeclock. Simple scene setting happens inside the house, as well, where the Lutron HomeWorks QS system also manages 22 hardwired Sivoia QS window shades and six battery-powered Sivoia QS Triathon shades (installed in places where it was difficult to add wiring). The ultra-quiet control and movement of the shades adjusting at set times of the day helps protect the interior decor and blends tastefully with the exterior of the home. In addition, the fabric that lowers over the windows is sheer, effectively mitigating the harsh summer sun and heat without obscuring the view. The family can bask in the beauty of the Montana’s “Big Sky” no matter where they happen to be — inside or outside. SmartHouse Integration of Sarasota, Fla., was asked to help make this island vacation home a bit more comfortable and very functional. The homeowners wanted all the comforts of home automation but insisted the simple island décor not be overwhelmed with electronics. The project incorporated multiroom audio distribution including outdoor speakers on the grounds, lighting, satellite and streaming TV, HVAC control, and security. However, while it is an island getaway, the CEO client needs to be in contact with the mainland for business purposes at all times. Getting services to the island is very limited and the integration team needed to be very innovative to ensure that the owners had a reliable smart house, with adjustments incorporated to suit the island challenges. SmartHouse based its design on the Elan automation system platform. The SC10 controller was used to integrate all aspects of the job. Elan s86A multizone amplifier was used to drive the six zones of audio through SpeakerCraft speakers and a separate A2 amplifier powering the grounds speakers. The home is wide open with very minimal wall space. Installing multi-gang switch plates was not an option, so SmartHouse utilized Lutron for all the lighting and had six-button keypads strategically placed throughout the multiple levels. More of a hurdle was meeting today’s requirement for proper network and Internet service. SmartHouse installed a Luxul network and enterprise-grade Wi-Fi system so the network was strong and reliable. But the big obstacle was getting bandwidth to the island for Internet and streaming. The homeowners tried satellite but that did not work, so SmartHouse turned to a cellular solution. The integrator installed a cellular antenna on a tower and pointed it to the closest cell tower. From the antenna, we fed a cellular modem with a SIM card and then fed the router and switches. The homeowners are consistently getting 20-30MB download speeds for the cost of a basic cellular plan. Streaming video and accessing the home system remotely is not an issue, according to the integrator. Keeping an eye on the property from the mainland is critical. The integrator installed a comprehensive security system and paired it with four Visualint IP cameras with full video analytics. The homeonwers insisted on a simple island decor, so electronics like speakers were hidden to the best of SmartHouse's ability. When the home is not occupied, we have several macros running for lighting and even outdoor music. The camera analytics are used as trip lines and trigger lights and notifications based on arming status and time of day. No one can approach the home without SmartHouse knowing about it. 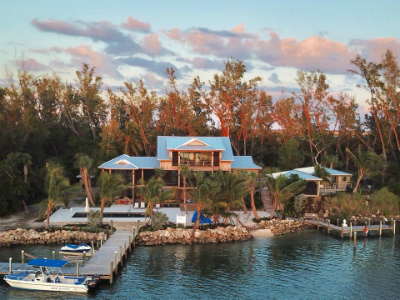 What started as a small vacation home on a remote island has turned into quite a destination for the clients, who now have all the comfort and access they need while relaxing on their private oasis in the Florida sun. Getting cellular data to the island to feed the home made this possible and the home has functioned flawlessly. The integrator even receives images from the client showing how much she loves her cameras and can watch the kids playing in the water. This 6,000-plus square-foot, light and bright custom home was built in the heart of the prestigious Dallas neighborhood of Highland Park. The owners envisioned two outdoor living spaces, with each space visible from the interior of the home, and called on Carrollton, Texas-based DeVance AV Design to address their outdoor tech wishes. The first space is an elegant loggia separating the family room and the outdoors only by a wall of glass doors and windows, creating a virtual extension of the family room into the outdoor spaces. DeVance leaned on its relationship with the builder, Booth Brothers Homes, communicating with their architects, landscapers and designers to help outfit the exterior (and interior) with the appropriate solutions. For audio in the loggia, DeVance installed 6-inch round Origin Acoustic speakers into the white boarded ceiling. 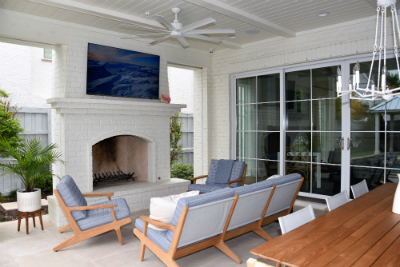 A sleek, mounted Samsung 65-inch Ultra 4K TV above the white brick fireplace can be enjoyed while entertaining friends and family in the loggia at the fireplace seating area, from the adjacent outdoor dining area, and can also be seen from inside the family room. The glass doors that separate these two areas can be opened fully, allowing the flow of the automated home to expand easily to the outdoors. The exterior lighting, pool lights, and ceiling fans, are controlled by a Lutron RadioRA system; in addition to the quick control, via the keypad, which is located just inside the loggia doors. And just as easily, the homeowner can work the RTI whole-house control system from the app on his iPad or iPhone. The second outdoor space is a cabana beckoning from the far end of the pool. 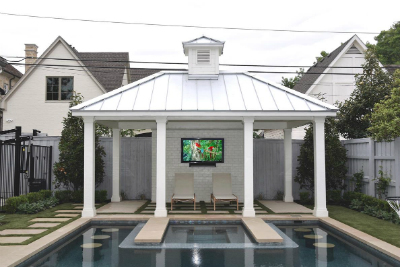 The homeowners and their guests can relax under cover while watching sports on the 65-inch Samsung TV, and with audio from a Sonos Playbar mounted under it, the homeowner enjoys surround sound for the game as well as an enhanced quality of sound for streaming music in the cabana. A Sony Blu-ray player, Apple TV, and two cable boxes are shared sources through an Atlona switch in the main home system for the enjoyment of guests in both the cabana and loggia areas. Simultaneously, the kids can fully immerse into a pool party and jam out to their favorite tunes emanating from the Proficient granite rock speakers doling out music to the area. 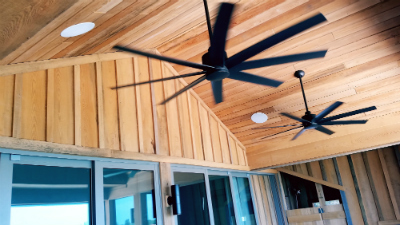 Combining the ease of control with RTI remotes throughout the house in addition to in-wall iPads, Lutron light switches, and keypads, the clients have shared with DeVance their delight in the ease of entertaining throughout their new outdoor paradise.